Some time you are required to do changes to your window registry so before you edit the window registry , make sure you back up all your window registry so If any problem occurs, you can then restore your registry files from your back up registry.But before we do start up backing up our registry we should know what is registry and why it is so important . What Is The Registry ? If we look at the definition provide by Microsoft that window registry are database that contain the information about system hardware,installed programs and setting’s .It contain information of both per-installed programs as well as program which we install manually to our system.so it is necessary for us if we made some changes to our registry , we should make back up of it first . 1. )Click Start, and then click Run . 2. )Type “regedit” in the “RUN“(see image below) and hit enter or click Ok. 3. 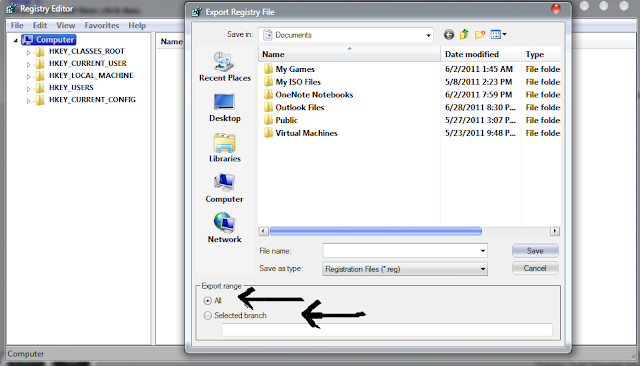 )Now once the regitry window opened click the file menu and then click on export(see image below). 4. )Now In the Save in box, select the boxs at the bottom the bottom according to whether you want to export all or only selected branches of the registry(see image below). . 5. )Next, select a location in which to save the backup .reg file. In the File name box, type a file name, and then click Save(see above image). Now to restore registry files that you exported, double-click on that registry files that you saved , after clicking it your all registry will be restored .